Start off your visit on the 11th (Wed): choose your vessel at Cap-Sea and then make a splash at Aqualand Frejus. To find photos, traveler tips, other places to visit, and tourist information, use the Saint-Raphael online trip maker . Toronto, Canada to Saint-Raphael is an approximately 14.5-hour flight. Traveling from Toronto to Saint-Raphael, you'll lose 6 hours due to the time zone difference. Expect a daytime high around 32°C in July, and nighttime lows around 22°C. Finish your sightseeing early on the 12th (Thu) to allow enough time to travel to Le Lavandou. Le Lavandou is a commune in the Var department in the Provence-Alpes-Côte d'Azur region in southeastern France. Start off your visit on the 12th (Thu): enjoy the sand and surf at Plage d'Aiguebelle, then stroll through Plage de Jean Blanc, and then kick back and relax at Plage de Cavaliere. On the next day, enjoy the sand and surf at Grande Plage du Lavandou and then enjoy the sand and surf at Plage de l'Estagnol. To find reviews, ratings, maps, and other tourist information, use the Le Lavandou visit website . Getting from Saint-Raphael to Le Lavandou by car takes about 2 hours. July in Le Lavandou sees daily highs of 33°C and lows of 21°C at night. Finish your sightseeing early on the 13th (Fri) so you can travel to Cassis. Cassis is a commune situated east of Marseille in the department of Bouches-du-Rhône in the Provence-Alpes-Côte d'Azur region in southern France.It is a popular tourist destination, famous for its cliffs (falaises) and the sheltered inlets called calanques. 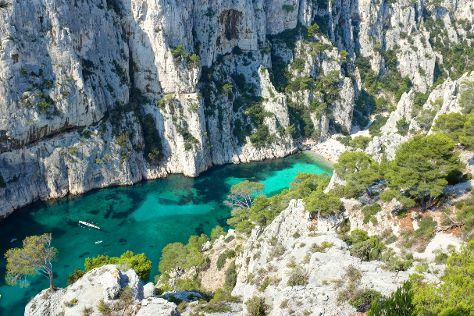 Start off your visit on the 14th (Sat): enjoy the sand and surf at Plage de la Grande Mer and then explore the striking landscape at Calanques. To find ratings, maps, more things to do, and more tourist information, use the Cassis trip itinerary planner . You can drive from Le Lavandou to Cassis in 1.5 hours. Expect a daytime high around 35°C in July, and nighttime lows around 22°C. Wrap up your sightseeing on the 15th (Sun) early enough to drive to Nice. Start off your visit on the 15th (Sun): meet the residents at Marineland. Keep things going the next day: take a stroll through Vieille Ville, get great views at Colline du Chateau overlook, and then make a trip to Place Massena. To find reviews, more things to do, where to stay, and tourist information, read our Nice journey planner . Traveling by car from Cassis to Nice takes 2 hours. Alternatively, you can take a train; or do a combination of train and bus. When traveling from Cassis in July, plan for slightly colder days and about the same nights in Nice: temperatures range from 32°C by day to 25°C at night. Finish your sightseeing early on the 16th (Mon) to allow enough time to travel back home.